Banco De Oro seems to be facing a lot of troubles lately. Another netizen posted rants due to the lost amount of cash from her sister’s account. This time, it costs 60,000 pesos. According to Diane Gail de Vera, her sister emailed BDO to ask for assistance on how to change the password through the mobile application. After a few hours, someone called the young woman up claiming to be a BDO agent. Is there really a system breach? Diane firmly believes that a system breach exists from the bank’s end. Just like from the other victims who shared their horror stories, Banco De Oro was not able to give specific explanations for the matter. 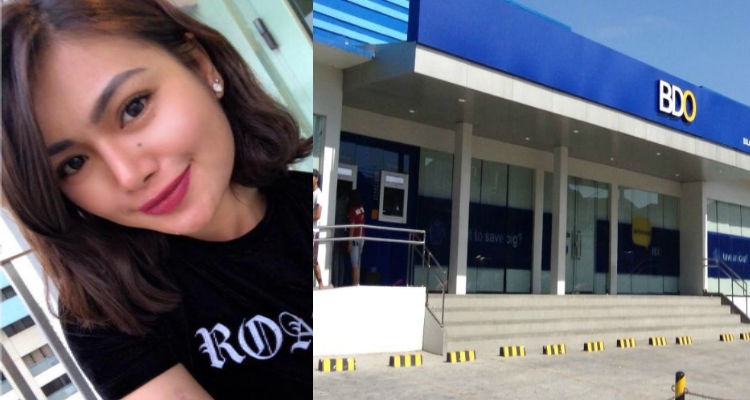 The young woman shared the story behind the alleged scam where her sister received 5 OTPs while on the phone with the BDO agent. She then received an email that she successfully changed her password without doing the steps yet. This stirs doubt because they are supposed to receive a temporary password before proceeding to the necessary steps. Right away, Diane’s sister checked her account through the mobile app and realized that her money was transferred from passbook to atm, leaving her with only 130 pesos. The incident was reported to the BDO customer care service where they were told to wait for the result of the investigation until Dec. 4. On Nov. 2, they received 3 emails disclosing the investigation results where the fund was transferred amounting to more than 38k. The last two transactions amount to 50k which is subject for pick up at a BDO branch in Sorsogon under the account name of a certain sender Hadji Nasser Hannah. The receiver’s name is Hadji Nasser Jalilah for a 10k fund transfer. Come Nov. 19, BDO emailed de Vera stating that the reported case is not valid for reversal. From thereon, the victim opts instead to talk to BDO customer care to further explain her claims. Despite efforts, the bank strongly sticks to its decision not to give out more information. Diane now seeks justice for the alleged scam caused by the bank. My sister emailed the bdo asking for assistance to change her password sa mobile banking kasi nung una di nya mafigure out how. And then hours later, someone called her using a mobile number saying na it’s from BDO. KUNG WALANG SYSTEM BREACH OR INSIDE JOB, HOW THE HACKER WOULD KNOW NA NAGSEND NG EMAIL YUNG SISTER KO TO UPDATE HER PASSWORD. CAN SOMEONE FROM BDO EXPLAIN THIS? AND I THINK BDO SHOULD SEND A TEMPORARY PASSWORD TO THE REGISTERED EMAIL WHEN CHANGING SUCH, BUT BDO DIDN’T SEND ANY. CAN BDO TRACK IT? THE ANSWER IS NO AGAIN. Because they cannot explain it how this happened. So walang system breach padin? The said bdo caller knew about her email kaya di na sya nag taka about dun and since may experience na sya dati na nagfile ng case about unauthorized transaction. Then, she received about 5 OTPs while having that call plus she received an email from BDO saying that she succesfully changed her password on her mobile banking. Dun na sya nagtaka kasi usually naman pag reset password may ibibigay silang temporary pass but she didnt get any. She tried to access her mobile banking then upon checking her accounts (atm and passbook), they transferred already from her passbook to her atm then nabawasan na yung passbook account nya and 130 pesos nalang ang natira sa atm account niya. She immediately called the BDO toll to report the incident. They gave her case id number and told her to wait for the response of BDO untill Dec. 4. She received 3 emails from BDO indicating all of the details of fund transfer and send money. The first amounted to 38,999 from her account(pasbook) to her atm account. then the last two were 50,000 which was for pick up at a BDO branch in Sorsogon. The sender’s name is not hers. Its HADJI NASSER HANNAH M. While the receiver’s name is HADJI NASSER JALILAH M and 10,000 fund transfer to account number 000720237742. BDO informed my sister that the case is not valid for reversal. We called immediately our BDO branch asking for assistance about this and then they checked the destination account and said that upon checking there was no such amount na pumasok sa destination account na yun and even them hindi alam ang isasagot why nagkaroon ng incident na ganito. kaya I asked my sister to call BDO customer care to ask about the details of the fund transfer but they said they cannot give out any information on the phone kaya she emailed again the BDO but ang reply AGAIN is they cannot give out information. So BDO, ask ko lang, saan napunta yung pera ng kapatid ko? Bakit puro di niyo nalang alam ang isasagot? basta ang sagot niyo nalang is not valid for reimbursement. 60,000 peso is a no joke lalo na sa mga bata. Hindi porket bata yung kapatid ko, hndi na magrereklamo. Una palang, ung pagsesend ng 50k gamit ang online banking is not valid. Because 10k max lang ang pwede isend online daily if not registered, so why did you allow it? 2nd, gabi may tumawag sa sister ko asking for the otp so probably gabi ginagawa ung kababalaghan na yan and immediateley nireport sainyo ung incident, so bakit hinayaan niyo padin na may mag pick up sa branch niyo na ganon kinabukasan kasi alangan gabi pa yan pinick up sainyo? Sigurado close na any BDO branch that time, 3rd, why ibang name ang sender? Hindi match sa may ari ng account? Hindi name ng sister ko? And lastly, as per talking sa bdo branch namin, wala naman daw nasend na pera dun sa inemail niyong destination account number? So what kind of investigation po ba ung ginawa niyo to tell us na not valid for reimbursement? Ma’am my sister called you many times, and you keep on telling her na you are not allowed to give any information, so bakit pa kayo naging customer care if that so? All we need are the basis why you came up with the decision not to refund my sister’s money. 60,000 is a no joke para sa bata. And I believe, she also have the right to know what happened to her money. As much as possible, we don’t like to do this na ibroadcast pa sa social media kaso puro kayo hindi niyo alam ang sagot. We are looking forward to hear from you to resolve this matter with FAIR JUDGEMENT. and hindi puro “hindi namin alam” ang sagot. Thank you. Please share for everyone’s awareness.